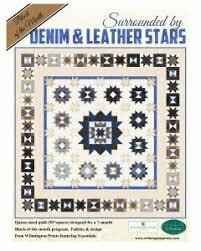 We're very excited to offer this new block of the month program to you, Surrounded by Denim & Leather Stars from Wilmington Prints! This dynamic, yet easy to piece quilt is designed with every quilter in mind! From confident beginner to the advanced quilter, this quilt can be custom to you! It has great space for custom quilting or even adding your own embroidery! It's especially suited for anyone who is looking for a first-time block of the month experience! Month #1-#7, you will receive a pattern and all fabrics to complete a section of the quilt and binding. Month #8 you will receive the backing. When completed the quilt will measure 90" square. Cost is $45.00 a month for 8 months. Starts March 2nd, 2019. Please call or come into the store to register and for further details. Mail order is available for all block of the month clubs!